Yogindra Vandana Das (aka John Berg) has been the temple president at New Talavan since 1994. Born in New Orleans in 1950, he would frequently vacation with his family on the Mississippi Gulf Coast, where they eventually purchased a summer home. 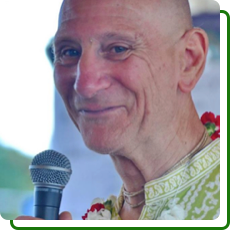 He joined the ISKCON New Orleans temple in September of 1971 and was engaged there as a brahmacari (student), as well as in selling Srila Prabhapada’s books and Spiritual Sky incense to support the temple. He moved to New Talavan with his wife, Maharani Tulsi Devi Dasi, in 1985.